What makes this a conversation about fundamental transformation is the recognition that there is a need for change. This may seem to be simple. But it’s deceptive. Transformation begins with the  of the need for change. Inevitably there are those with interests in the traditional way and they are likely to perceive change as loss. When transformation has become an imperative, the trend lines that define the future of the business model demonstrate that the status quo will no longer be sufficient to ensure the future viability of the enterprise. 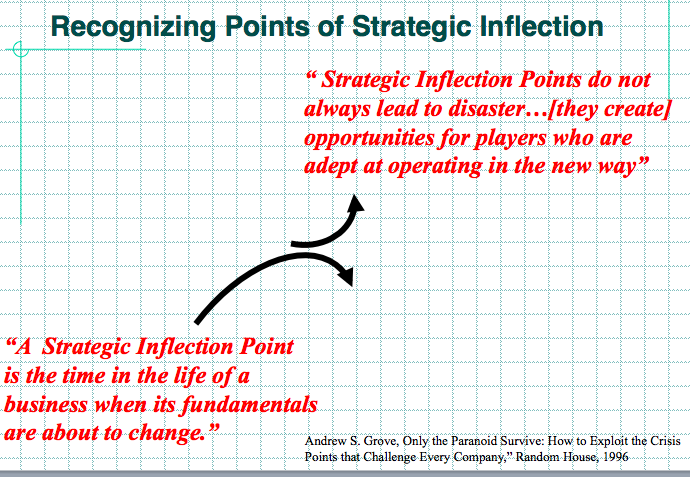 Andrew Grove, the former Chairman of Intel has devoted a significant amount of his career to studying this concept that he has called “strategic inflection.” “A strategic inflection point is the time in the life of a business when its fundamentals are about to change”, Grove has written. But at the same time, there are often simultaneous opportunities to invest in the future and in doing so to guarantee future viability in a competitive marketplace. Grove wrote that he focuses on those fundamental variable that keep him up at night because he knows that if they were to change it would imperil the future. He wrote that he monitors these critical variables looking for 10x changes.